Shop unique Beagle Gifts. Shepherd's Grove Studios makes Beagle Items that you will be proud to own or give to the Beagle lover in your life. We offer a variety of items such as Beagle mugs, wine stoppers, dipping bowls, treat jars, and more. You can choose from the standard coat color or have your Beagle gift customized to reflect you dog's colors and coat pattern (a small art fee us charged for custom work). 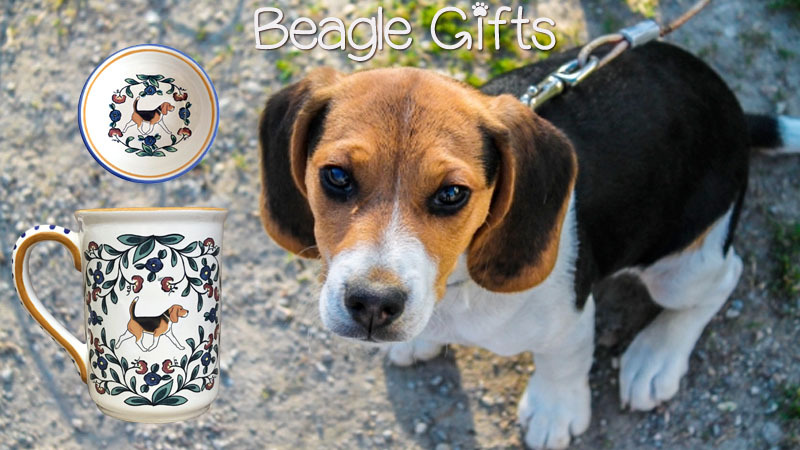 All of our Beagle pottery is as durable as it is beautiful. Feel free to use it daily – pop it in the microwave it and put it in the dishwasher for easy cleaning. The original Beagle design will maintain its vibrancy because the decal becomes part of glaze surface during the final kiln firing. Our Beagle gifts are made for you when you order, so items can take 2-3 weeks to ship. Have you ever seen beagle you didn't like? It may be an impossibility. From Snoopy to Miss P who won Westminster in 2015, they have that irresistiblequality that you can't take your eyes off of. Is it the floppy years, or the cute stout body, or their confidence? Whatever it is, it can't help but make you smile, much like our Beagle gifts.